What's Perpetual Motion Freestyle? Think of it as ''swimming for grownups''. The traditional way of swimming freestyle is designed to maximize speed in the short term but makes you tire quickly and increases risk of injury by emphasizing fast, shorter, powerful strokes. Total Immersion's Perpetual Motion Freestyle is designed to help you swim longer with more ease and enjoyment, and to allow for the easiest transition from pool swimming to open water. There is no more efficient - or satisfying - way to swim freestyle! Previous Total Immersion swimming DVDs have helped thousands transform struggles into skills, because they provide a rich visual guide to the key positions and movements of low-drag, high-fluency swimming. 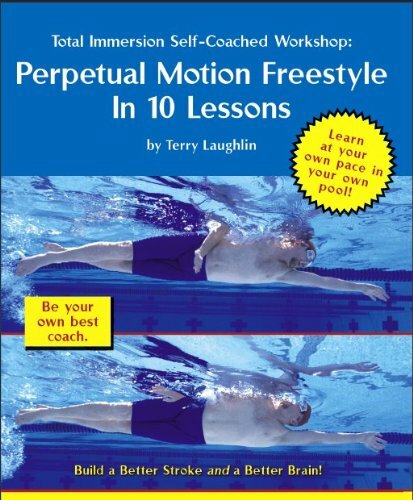 The Self-Coached Workshop on Perpetual Motion Freestyle goes a step further by teaching you how to learn, not just how to swim. Dozens of fine points and tips on how to avoid the most common missteps and increase your sense of clear direction are provided, based on TI's years of coaching experience. Whether you want to train for Olympics swimming or simply build your skills, this is a must-have for every swimmer!